Looks Good from the Back: Marianne: The Holy Grail. Drop everything, because I have found the most perfect t-shirt I've ever put on. A t-shirt worth its steep (for a t-shirt, but not crazy) price. This holy grail t-shirt? 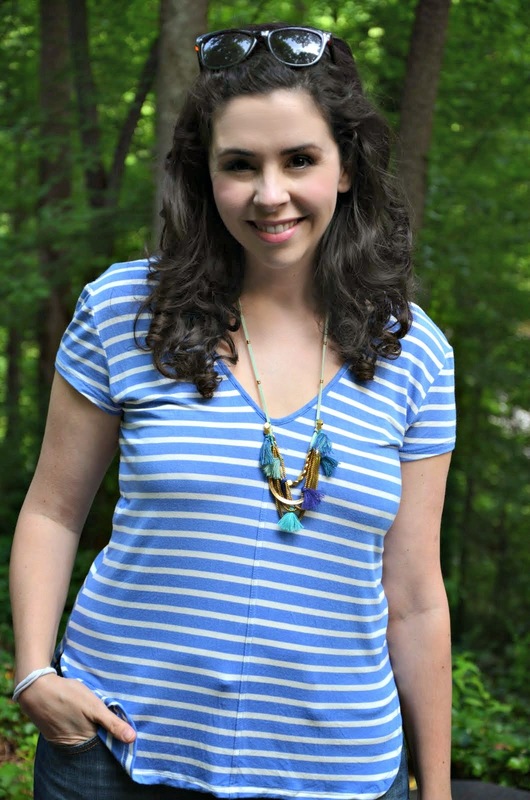 The Elementary V-Neck from anthropologie. Here is why it's perfect: the weight is substantial enough that it's not see-through and it has this lovely drape to it. The sleeves are the perfect length, the v-neck juuust deep enough, the side vents are cute and add interest, and the seam down the center is VERY flattering. I (no lie) have never been complimented on my "sudden" (not sudden) weight loss as much as I have wearing this exact shirt. It got kind of weird. I was given this striped version for my birthday, and (armed with my birthday discount), I've already bought it in two more colors (mint and orange). I will probably get a couple more because seriously. Perfect, perfect t-shirt. 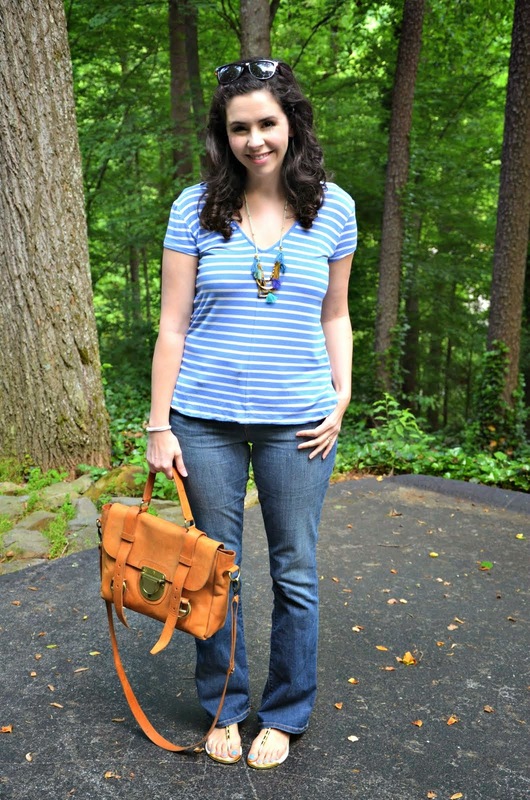 I'm wearing it with some Dolce Vita sandals (on CRAZY sale in some sizes), my new favorite necklace, my old favorite bag, and of course my perfect most favorite jeans. Boom, the best early summer casual outfit. I feel happy in this. It's so cute, but why does it have to cost $38? I'm going to need to go shopping with my mom sometime soon. Such a cute top! How was the sizing? The reviews on Anthropologie's website seem to suggest that sizing down is appropriate. Maggie, it's definitely generously sized. I'm wearing a small here, and it's got plenty of room (I'm typically a size medium).